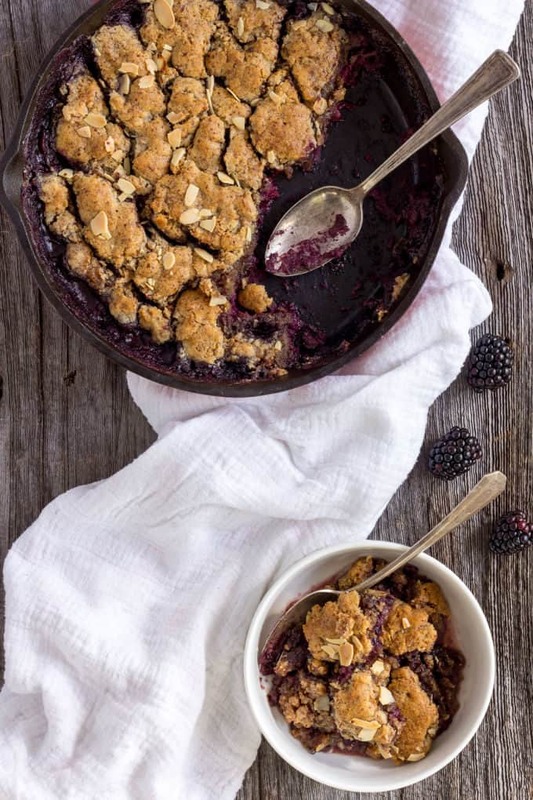 This simple blackberry cobbler in a cast-iron skillet is the closest you can get to the Old-Fashioned recipe while staying 100% healthy. Made with only 7 ingredients and whipped up under 10 minutes, you can have this delicious dessert ready within the next hour. This recipe is Vegan, Paleo, Gluten-Free, Dairy-Free and can be made Low-Carb by replacing maple syrup with proper amounts of stevia or any other sugar-free sweetener. It’s finally summer and berries are all the rage right now! LOVE it. What’s your favorite? I’ll go with the bold guess that since you ended up here, you must have a soft spot for blackberries. Well, I don’t know about you for sure… But I DO. I love em so much I’d eat them all day if it wasn’t for the fact that to do so, I’d probably have to get a second mortgage, sell my car or get three jobs. Fortunately, recipes like this one can be made with frozen berries. You will barely see the difference, I promise. Joy. Just pure joy. I think it’s the most accurate word to describe my two-year-old’s facial expression at first bite. You could see, even at her young age, that she was enjoying the moment, quietly, just smiling. 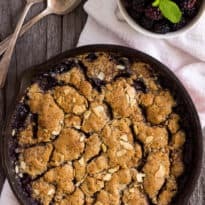 Blackberries in this recipe can be replaced with the same amount of blueberries, strawberries, raspberries, peaches or any other fruit you think would make sense. Feeling a bit creative? Just mix and match! How I served it? Warm. With a huge scoop of vanilla ice cream of course! I mean… Isn’t it summer after all? 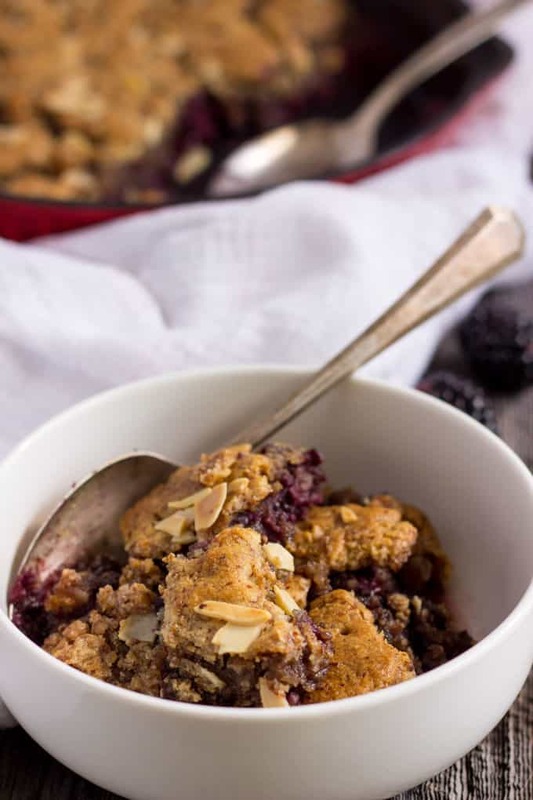 All of these topping options will make this dessert a bit less healthy, so you’ll be happy to hear that this blackberry cobbler is delicious without any additional topping. For this recipe, I used a 9-inch cast-iron skillet, but a baking dish of roughly the same size is perfectly fine. How to store it? You can leave it on the counter for 2-3 days, covered. But will it last that long? Looking for more healthy, vegan, paleo, and gluten-free recipes like this one? Feel free to head over to my blog onecleverchef.com. You can also follow me on Facebook and Pinterest. In a large bowl, mix the almond flour, baking powder, coconut oil, maple syrup, and vanilla extract thoroughly with your hands until it makes a thick dough. 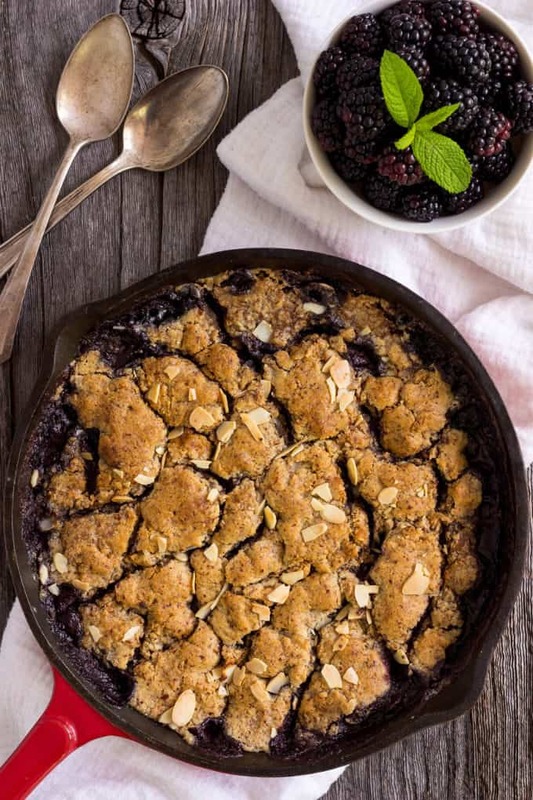 Place the blackberries into your cast-iron skillet, pour the lemon juice over them and gently stir with a spoon. Spread the berries evenly in the bottom of the skillet. 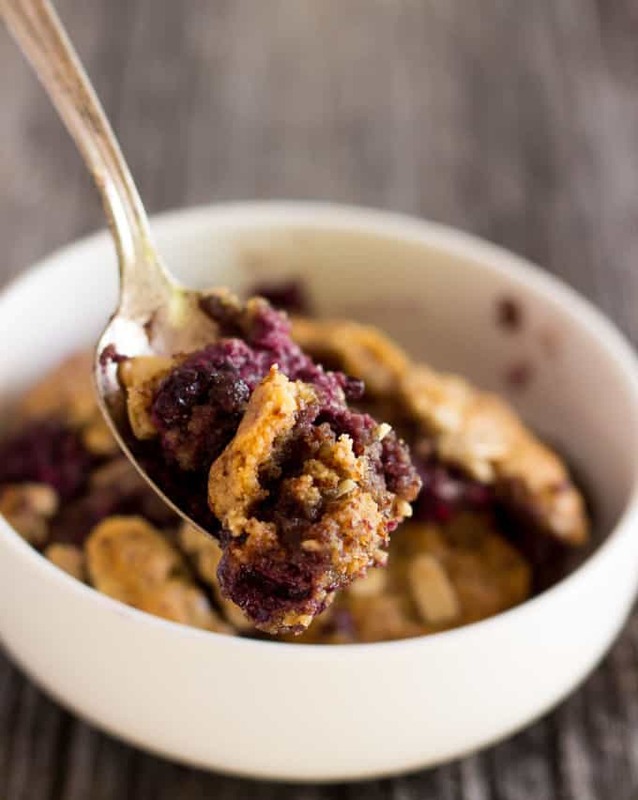 Crumble the almond flour mixture over the blackberries. * Adjust to cover just the bottom of the skillet without leaving any “dead space”. ** Recipe nutrition is a rough estimate calculated without any additional toppings. Father, devoted man of the house, and healthy food enthusiast, Gabriel is the food blogger, recipe developer, writer, and photographer behind the blog onecleverchef.com. The philosophy behind his work is to promote the use of real food instead of traditional unhealthy ingredients by creating simple healthy recipes, without ever sacrificing on taste. Oh dear! So into cobblers ! Thank you so much ! I hate to say this but blackberries grow like weeds here on the south coast in BC. Every summer I take a bucket a few blocks to the local park and pick for an hour and I have enough to make dessert and jam and put some in the freezer. We are definitely living in the right part of the world. Oh lucky you! I guess it is too cold here in Eastern Canada. Blackberries are a luxury here! Hope fully I will get enough berries from the CSA to make this, otherwise I will go the frozen route. MMMM! 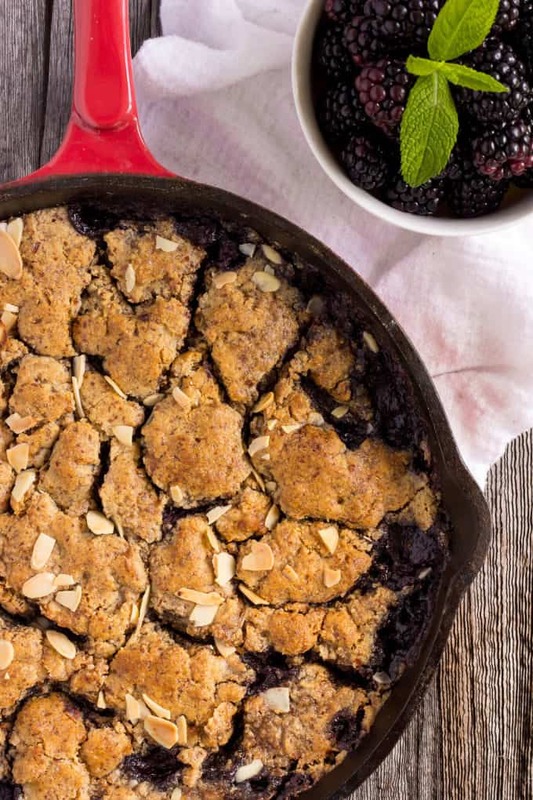 The cast iron skillet is the perfect look for any cobbler. I love recipes using almond flour, so tasty! Our Blackberry Bushes have been loaded this year, what a great recipe to try. Thanks so much for sharing with us at Full Plate Thursday and you have a great weekend! I have so many fond memories of blackberry cobbler. My aunt had a patch of berries that grew like crazy, she would always can them and when we visited she would make her famous blackberry cobbler. It was so amazing!! I will have to try this recipe and see how it compares!! It looks great! My favorite! Now, I can make it in the skillet. Thanks for sharing at the Inspiration Spotlight Pinned & sharing.